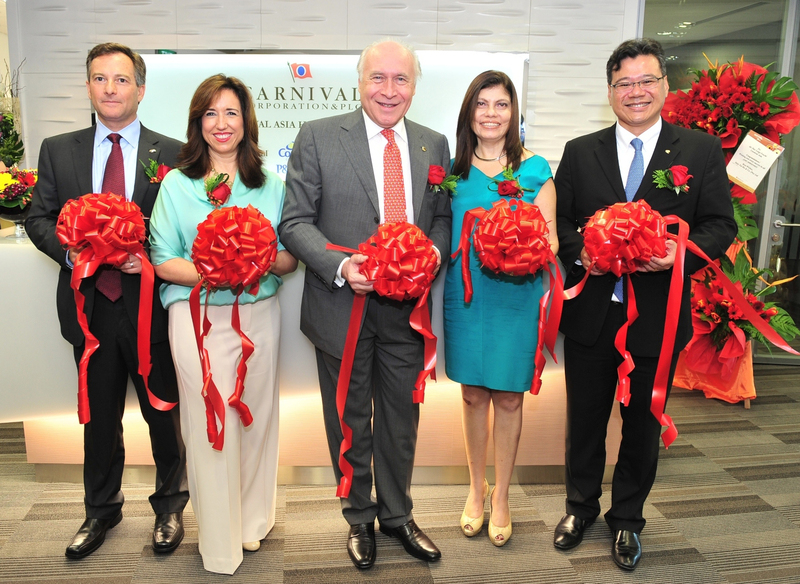 Carnival Corporation & plc today officially opened its regional office in Singapore. The Singapore office houses the new Carnival Asia unit which was created to oversee the company’s expansion in Asia. 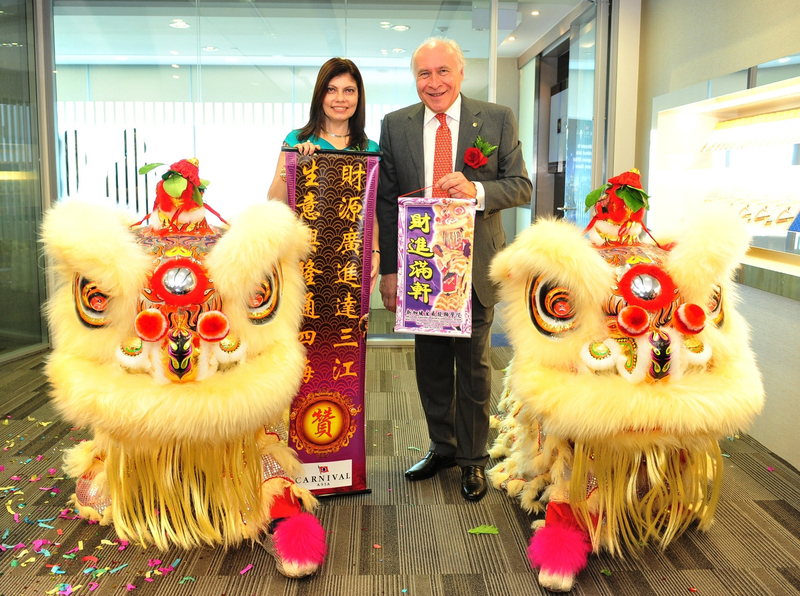 To commemorate the occasion, Carnival Asia Chairman and CEO Pier Luigi Foschi led a ribbon-cutting ceremony which also featured a traditional “lion dance” performance, a centuries-old Asian tradition designed to usher in prosperity and represent dynamism and tenacity. This was followed by a reception and dinner in the evening on board the Costa Atlantica which made its maiden call to Singapore today. Singapore’s Minister (Prime Minister’s Office) and Second Minister for Home Affairs and Trade & Industry, Mr. S. Iswaran, was the guest of honor at the event. Among the more than 300 guests in attendance were Singapore government officials, local dignitaries and VIPs as well as senior representatives from the travel industry such as Christine Duffy, president and CEO of the Cruise Lines International Association. As part of its expansion strategy for the region, Carnival Corporation & plc brands Costa Cruises and Princess Cruises continue to grow their operations in Asia. Costa Atlantica, the biggest ship in the Costa fleet to be deployed in the region, set sail to Asia for the very first time this week, joining Costa Victoria and more than doubling Costa’s capacity in Asia. Costa Atlantica will set sail from Singapore to Malacca and Penang for three-night journeys, and it will also operate four-night trips to Phuket and Langkawi. Princess Cruises will be introducing the largest deployment ever by a premium cruise line in the region when it brings Sapphire Princess to Singapore for four months starting November 2014. The itineraries, which vary from three to 11 days, will combine various destinations such as Bangkok, Ho Chi Minh City, Kuala Lumpur, and Ko Samui. “The market potential for cruising in Asia is huge as the total potential number of cruise passengers could reach 3.7 million by 2017, and double to over seven million by 2020,” said Foschi. Foschi also noted that the benefits of growing the regional cruise industry to homeport destinations are significant, providing direct and indirect economic impact and employment in providing goods and services to ships, passengers and crew, as well as adding to tourist arrivals with the influx of North American and European guests vacationing in the region. Carnival Asia is a unit of Carnival Corporation & plc, the largest cruise company in the world, with a portfolio of cruise brands in North America, Europe, Australia and Asia, comprised of Carnival Cruise Lines, Holland America Line, Princess Cruises, Seabourn, AIDA Cruises, Costa Cruises, Cunard, Ibero Cruises, P&O Cruises (Australia) and P&O Cruises (UK). Together, these brands operate 101 ships totaling 205,000 lower berths with eight new ships scheduled to be delivered between May 2013 and April 2016.